On Sept. 23 - and the following days, I had a chip poll up. Cheetos won (over Fritos, potato chips, Doritos and carrot sticks). On that day's post (Sept. 23) I got some great ideas on using chips - and cookies - by my cousin Audrey. Those ideas are used in prison... and can be used by poor college students - or poor anybodies. Click HERE to go to that post and read the first comment (by Audrey). The fourth comment (which is by Audrey) is also good. Carla and I did it!!!! 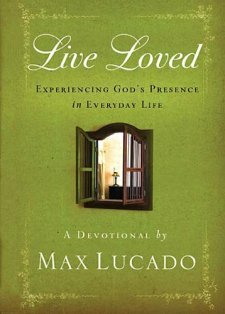 TODAY - (THIS VERY MORNING) we got through Max Lucado's book LIVE LOVED!!! It has 145 little chapters - and for the last 145 days we have read one each day - and emailed our thoughts to each other on each day's reading!!!! Now every 'thought' wasn't wonderful. We also wrote stuff like, "Wow, today's reading is just what I needed.... etc., etc." We wrote more of that kind of thought, definitely. MOST DEFINITELY. Anyway, I would HIGHLY recommend it. Now if doing this does seem like homework to you, cut yourself some slack.... you may not be wired like Carla and me. But do get close to God, okay? Through the Bible. Don't forget to take the poll, please. How wonderful! Way to go finishing it! Have you read "Jesus calling"? It's a good daily read too! No, I haven't read that, Elizabeth. I was really excited about you finishing... then I saw Elizabeth commenting, and that was super exciting too! Life is beautiful and good. Wow! "145 days" feels like we experienced a lifetime together. The highs, the lows...the smiles and the tears...they all brought us closer to God and to each other! What an experience! I'm glad I shared it with YOU!!! Thank you Nancy - for so many things! I thank God for you every day! That's great you and Carla finished that book. You come up with the most interesting polls. Fun!!! We didn't try that vinegar solution you suggested - but maybe next time! Hey Nancy, thanks for sharing my comments/recipes on cooking with very little resources. I really want to comment today on what you and Carla did. Back when you first told us about it, and shared your methods I thought it was a wonderful idea. And I have found it is. I asked a dear friend to do this with me, oddly I hadn't seen her in years either. We are doing it using Max Lucado's "Grace For The Moment". It has brought us so much closer as we have enhanced our friendship by becoming sisters in Christ. Some days we write a lot and other days not so much and on occasion we take a day or two off. But, I have grown so much. As you put it, articulating my thoughts and sharing it with another person, just grows that learning. Some days I spend a couple minutes and other days as much as an hour as I sort through all my thoughts. When I write, it causes me to organize my thinking and actually feels like a bit of a committment to follow through my thinking on my initial thoughts. I will mention, I have read this book twice by myself, and didn't begin to garner the lessons I am receiving now. Thank you, thank you, thank you for getting me started on this almost daily exercise. It is a beautiful infusion of God's love into each of my days. When you and Carla do this...do you ever think you could write your own devotional book with what you have written. I bet you could!! I like the idea of using "Jesus Calling" by Sarah Young, it is a fantastic book. Another one I really like and want to use in the future is "Streams In The Desert" by L.B. Cowman, edited by Jim Reimann. There are really so many possibilities! Love to you Nancy! Thank you for being such an inspiration.